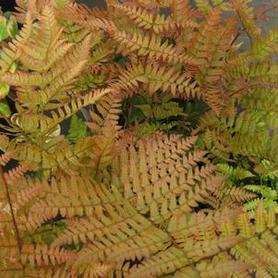 Brilliance™ Autumn Fern was selected for its striking new fronds which emerge throughout the spring and summer in shades of salmon, copper and orange. The semi-evergreen fronds then mature to glossy medium green, adding a bright note to woodland settings. Since Autumn Ferns spread slowly by rhizomes, they make a good groundcover in shady sites. Consistent moisture is needed to promote new frond production.